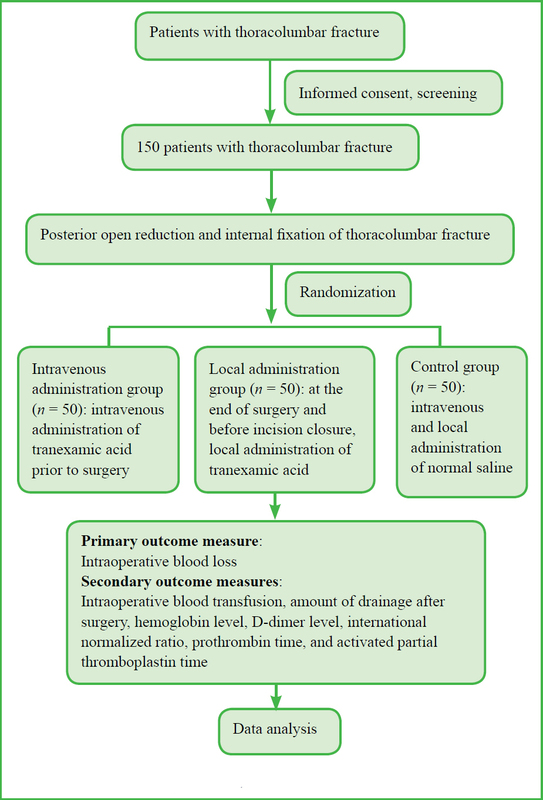 Background and objectives: Local bleeding is relatively frequent during and after posterior open reduction and internal fixation of thoracolumbar fractures, with associated health risks. Both local and intravenous tranexamic acid have been shown to effectively reduce intraoperative blood loss, but the optimal method for achieving intraoperative hemostasis remains unclear. This study aims to compare hemostasis following local and intravenous tranexamic acid administration in patients undergoing posterior open reduction and internal fixation of thoracolumbar fractures. Design: A prospective, single-center, parallel-group, randomized controlled trial. Methods: This trial is conducted in 150 patients undergoing posterior open reduction and internal fixation of thoracolumbar fractures at the Department of Orthopedics, the General Hospital of Western Theater Command, China. The included patients are divided randomly and evenly into three groups (n = 50 per group). Patients in the intravenous administration group receive 100 mg/kg tranexamic acid dissolved in 100 mL normal saline intravenously 15 minutes before surgery; in the local administration group, the wound is flushed with a mixture of 10 mg/kg tranexamic acid and 50 mL normal saline before wound closure. Excess fluid is removed 10 minutes later using an aspirator and the wound is closed. Patients in the control group receive intravenous and local administration of normal saline. All patients are followed up at 1, 3, and 5 days after surgery. Outcome measures: The primary outcome measure is intraoperative blood loss, as a measure of intraoperative hemostasis. The secondary outcome measures are intraoperative blood transfusion, amount of drainage at postoperative days 1, 3, and 5, hemoglobin level, D-dimer level, international normalized ratio, prothrombin time, and activated partial thromboplastin time before surgery and at postoperative days 1, 3, and 5. Disscusion: This study compares hemostasis following local versus intravenous tranexamic acid administration in patients undergoing posterior open reduction and internal fixation of thoracolumbar fractures, to determine the optimal intraoperative hemostasis program for reducing surgical risk. Ethics and dissemination: This study has been approved by the Medical Ethics Committee of the General Hospital of Western Theater Command, China (approval No. 2015-keyan-03). The version of study protocol is 1.3. Patients and their family members should participate in this study voluntarily and written informed consent should be obtained from each patient. Results will be disseminated through presentations at scientific meetings and/or by publication in a peer-reviewed journal. Trial registration: This study protocol was registered with Chinese Clinical Trial Registry (registration number: ChiCTR-ICR-15006037) on January 26, 2015. Intravenous administration is currently the most common route of tranexamic administration, and intravenous tranexamic acid (10 mg/kg) has been shown to effectively reduce blood loss during spinal surgery. However, systemic tranexamic acid is associated with certain side effects, including gastrointestinal reactions, kidney damage, visual impairment, and generalized muscle spasms, and can also increase the risk of thrombosis. 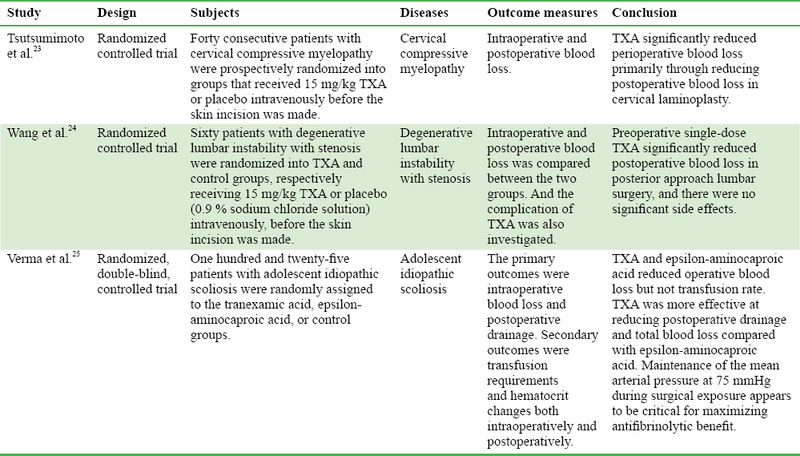 Local application of tranexamic acid during spinal surgery has been reported to reduce intraoperative blood loss by about 30%, suggesting that local application may be safer and more effective than systemic administration during spinal surgery; however, the relative hemostatic performances of local versus intravenous tranexamic acid in spinal surgery remain unclear. We (JS) previously searched the PubMed database for papers reporting the application of tranexamic acid in spinal surgery, published between January 2001 and December 2014, using the search terms “spine” and “tranexamic acid”. Three identified randomized controlled studies,, are listed in [Table 1]. The current study aims to compare the hemostatic effects of local and intravenous tranexamic acid in patients undergoing posterior open reduction and internal fixation of thoracolumbar fractures. The purpose of this study is to investigate the hemostasis effect of local versus intravenous tranexamic acid in the posterior open reduction and internal fixation of thoracolumbar fracture. This prospective, single-center, randomized, parallel-group, controlled trial includes 150 patients with thoracolumbar fractures who are receiving treatment at the Department of Orthopedics, the General Hospital of Western Theater Command, China. Patient recruitment is performed using leaflets to advertise the study among patients in the wards. Patients interested in participating are asked to contact the principal investigator via telephone, and are included according to the eligibility criteria, after providing written informed consent. All patients are randomly divided into the following three groups (n = 50 per group) using a random number table: intravenous administration, local administration, and control groups. Double blinding and allocation concealment are not used in this study. Nurses not related to the trial complete the drug assignment according to grouping, while avoiding the investigators participating in this study. The medical personnel who test the indicators are not aware of the content of the study protocol. Posterior open reduction and internal fixation of thoracolumbar fracture: Surgical segments are determined by C-arm fluoroscopy. Taking the surgical segment as the center, a posterior median incision is made. The skin and subcutaneous tissue are then cut layer by layer to fully expose the injured vertebrae and the pedicle screw points of the upper and lower adjacent segments. The screw paths are prepared according to conventional methods. Scouting and intraoperative fluoroscopy are performed to determine the position and orientation of the screw path, and pedicle screws of appropriate lengths are inserted. After confirmation of the screw position, laminar decompression is performed in patients with obvious intraspinal space occupation or obvious nerve compression symptoms, but not in patients without these features. Connecting rods of appropriate lengths are pre-bent and inserted. The injured vertebra is opened and reduced, and the screw caps are tightened. After appropriate intervertebral compression, the injured vertebra is tightened and fixed. Fluoroscopy is repeated to determine the reduction of the injured vertebra. Autologous or allogeneic bone is implanted posterolaterally. The surgical wound is flushed, a drainage tube is placed, and the wound is sutured layer by layer. Intravenous administration group: 10 mg/kg tranexamic acid (tranexamic acid for injection, 1000 mg/10 mL, lot number: DK405004-1, Zhejiang Jinhua Conba Bio-Pharm Co., Ltd.) is dissolved in 50 mL normal saline 15 minutes before incision, and then used to flush the wound and left for 10 minutes. Excess fluid is removed using an aspirator and the wound is then closed. Local administration group: 10 mg/kg tranexamic acid is dissolved in 50 mL of normal saline before incision closure, and used to flush the wound and left for 10 minutes. Excess fluid is removed using an aspirator and the wound is then closed. Control group: Normal saline is administered intravenously and locally, with no tranexamic acid intervention and no use of other hemostatic drugs. Drug distribution and storage: drugs used in this study are stored by a staff member unrelated to this study, and kept in a designated dry counter at normal temperature. The staff members responsible for drug management provide the drugs according to the study protocol. At the end of drug administration, the remaining drugs and empty bottles are recovered and registered. All drugs and sealed opaque emergency envelopes are kept in a safe place and handed over to the data analysts. Intraoperative blood loss, as a measure of intraoperative hemostasis, is assessed by nurses unrelated to this study. The amount of intraoperative blood loss = amount of blood loss in the bandage + amount of blood loss in the aspirator collector-amount of flush fluid. Intraoperative blood transfusion: total intraoperative blood transfusion. Amount of drainage at postoperative days 1, 3, and 5: total amount in the drainage bag after surgery and before removal of drainage tube. Hemoglobin level before surgery and at postoperative days 1, 3, and 5: hemoglobin level is measured using an automatic blood cell analyzer (Model: XE2100; Shenzhen Mindray Bio-Medical Electronics Co. Ltd., Shenzhen, China,). Total hemoglobin reduction = estimated whole blood volume × (preoperative hemoglobin level – hemoglobin level at postoperative day 5) × 10 + volume of transfused hemoglobin. Estimated total blood volume = 0.3669 × body height + 0.03219 × body mass + 0.6041 (for men), or 0.3561 × body height + 0.03308 × body mass + 0.1833 (for women). D-dimer level before surgery and at postoperative days 1, 3, and 5: D-dimer level is measured using an automatic blood cell analyzer (Model: CA-7000; Sysmex Co., Kobe, Japan). D-dimer level mainly reflects fibrinolytic function. Normal D-dimer levels are < 200 μg/L. D-dimer levels are often increased in secondary fibrinolysis, such as hypercoagulable state, disseminated intravascular coagulation, kidney disease, organ transplant rejection, and thrombolytic therapy. International normalized ratio (INR) before surgery and at postoperative days 1, 3, and 5: prothrombin time is measured using an automatic blood cell analyzer (Sysmex). INR is calculated based on prothrombin time and the international sensitivity index of the measured reagent. A higher INR indicates a longer prothrombin time. Prothrombin time before surgery and at postoperative days 1, 3, and 5: prothrombin time refers to the time required for prothrombin to be converted to thrombin after the addition of excess tissue factor in plasma lacking platelets, resulting in plasma coagulation. Prothrombin time is used to determine coagulopathy. Activated partial thromboplastin time before surgery and at postoperative days 1, 3, and 5: activated partial thromboplastin time is used to determine coagulopathy and is measured using an automatic blood cell analyzer (Model: CA-7000; Sysmex). The normal range is 31.5–43.5 seconds for men and 32–43 seconds for women. Vital sign observation and laboratory tests: after surgery, patients will receive routine electrocardiography monitoring and continuous blood oxygen saturation monitoring. Blood pressure, respiration, and heart rate will be regularly recorded. Definition of adverse events: Adverse events refer to any adverse reactions that occur after medication and these adverse reactions may be unrelated to medication. Recording of adverse events: Any adverse events that occur during the study, including laboratory abnormalities, must be carefully interrogated and tracked. All adverse reactions must be judged for their nature, severity, and drug relevance, and will be truly recorded in the case report form. Correction evaluation: The adverse events are definitely, probably, possibly or likely related or not related to medication. The incidence of adverse events that are definitely, probably, possibly or likely related to medication will be calculated. Severity evaluation: The severity of adverse events can be graded into mild, moderate and severe. Mild adverse events refer to the transient adverse reactions that do not influence daily activities. Moderate adverse events refer to the adverse reactions that influence daily activities but can be tolerated with no need of drug withdrawal. Severe adverse events refer to the adverse reactions that make patients unable to perform daily activities or unable to tolerate the symptoms, and there is a need to withdraw drug use. Adverse event management during and after the trial: Adverse events should be observed and recorded during and after the trial. Patients who withdraw from the study because of adverse events should be followed up until complete relief of symptoms. Investigators should judge whether the occurring adverse events are related to the study drugs and provide supportive evidence. Any adverse event that meets one or more of the following conditions will be considered severe adverse event: (1) Death or life-threatening; (2) hospitalization or prolonged hospitalization; (3) disability, complete or partial loss of viability; (4) a risk of congenital malformations or defects. Any severe adverse event should be reported to the implementer, principle investigator, ethics committee, the state/provincial food and drug administration, and medical administrative command. Possible drug-related adverse reactions include intracranial thrombosis and hemorrhage, diarrhea, nausea, and vomiting. Some central nervous system symptoms, such as blurred vision, dizziness, and fatigue may occur after injection of tranexamic acid. This occurs possibly because this drug can enter the cerebrospinal fluid. The corresponding treatment methods are to withdraw the drug immediately, and symptomatic treatment should be promptly performed. According to our clinical experience, it was hypothesized that the reduction in hemoglobin loss was to be over 35%., Assuming α = 0.05, β = 0.2, a final effective sample size of n = 38 per group was calculated using the PASS 11.0 software (PASS, Kaysville, UT, USA). Assuming a patient loss rate of 20%, we would require 50 patients per group. All data will be statistically processed using the SPSS 22.0 software (IBM, Armonk, NY, USA). Measurement data will be expressed means, standard deviation, median, minimum and maximum values, upper and lower quartiles. Count data will be expressed as percentages. Baseline balance and comparability between groups will be evaluated. Then effective indices intraoperative blood loss, intraoperative blood transfusion, postoperative drainage amount, hemoglobin level, D-dimer level, international normalized ratio, prothrombin time, and activated partial thromboplastin time will be compared between groups. One-way analysis of variance and the least significant difference test will be used for comparison of normally distributed data between groups. Kruskal-Wallis H test will be used for comparison of abnormally distributed data between groups. Repeated measures analysis of variance will be used for comparison of one index in the same group between different time points. Pearson correlation analysis (normally distributed data) or Spearman correlation analysis (abnormally distributed data) will be used for analysis of correlation between indices. An inspection level of α = 0.05 (unilateral) will be considered. Included patients will consist of populations assigned to per-protocol set. The patients that complete treatment interview and do not have the situations of violating protocol that obviously affect the efficacy are included. Patients’ clinical records will be used as the original data of the clinical trial and well preserved. All data filled in case report forms will be checked for its accuracy and completeness as well as consistency with original records. All corrected or commented mistakes will be signed and dated by the investigators. All laboratory data will be recorded on, or original report sheets will be pasted on case report forms. Data within normal limit should be also recorded precisely. The data that obviously deviated or are outside the clinically acceptable range will be verified. The unit of measurement used should be indicated. All original data, documents, laboratory reports, summary reports, and clinical trial results must be retained for later use. All documents should be managed by designated persons. They cannot be reached without approval. Data stored or referenced in the archives should be indexed for easy retrieval. These documents should be preserved for at least 5 years after termination of the study. The ownership of all data obtained in this study belongs to the implementer. With the exception of requirement by the State Food and Drug Administration, the investigator may not provide the third party the study data in any form without the written consent of the implementer. To protect the privacy of the subjects, the subject’s name should not appear on the case report form. The investigator should confirm the subject’s identity and record it according to the subject’s code. All anesthesiologists participating in this study have 5–10 years of experience in performing posterior open reduction and internal fixation of thoracolumbar fractures. The surgery will be performed by associated chief surgeons or those with higher professional titles. The clinical monitor will visit the trial site on a regular basis or according to the actual situation to conduct clinical audit work. The Independent Data Monitoring Committee will report the progression of the Medical Ethics Committee in time. Trial registration will be updated simultaneously. Patients included in this trial will bear responsibility for medical treatment, examination, and surgery costs. They will receive tranexamic acid use without charge and complimentary laboratory tests and imaging examinations for the evaluation of drug-related adverse reactions. The principle investigator will be responsible for study implementation. Unified testing indices, expectant operational procedures, and quality-control programs will be established. The national legal unit of measurement for each index will be adopted. The investigators participating in the clinical trials must have special expertise, qualifications, and competencies required by the reviewers. They should receive professional training to fully understand the study protocol and study indices before the start of the trial. The clinical trial will be performed in strict accordance with SOP and study protocol. Data should be recorded in time. After accuracy confirmation, they should be signed and dated. Corrections should be made according to designated methods. Both the implementer and the researcher should perform their respective duties, strictly follow the clinical trial protocol, and adopt standard operating procedures to ensure the quality control of the clinical trial. All data and findings should be checked. Quality control should be performed at each stage of data processing to ensure complete, accurate, true, and reliable data. The project monitor will be appointed by the implementer to ensure that the rights of the subjects in the clinical trial are protected; the obtained data are complete, accurate, and true; and the study is performed according to the approved study protocol and applicable regulations and laws. This study has been approved by the Medical Ethics Committee of the General Hospital of Western Theater Command, China (approval No. 2015-keyan-03) (Additional file 1 [Additional file 1]). The version of study protocol is 1.3. This manuscript was prepared according to the Standard Protocol Items: Recommendations for Interventional Trials (SPIRIT) statement (Additional file 2 [Additional file 2]). This study will be performed in strict accordance with the Declaration of Helsinki (2012) and applicable regulations and laws after acquisition of a medical approval from medical ethics committee. Patients will volunteer to participate in this study. Patients must provide written informed consent after fully understanding the objective, nature, treatment procedures, lasting time, possible benefits and risks before participation in this study (Additional file 3 [Additional file 3]). Open spinal surgery involves much muscle tissue exfoliation, and the risks of intraoperative and postoperative bleeding are increased because of the exposed bone structure.,,, The local coagulation system activates to form a thrombus to stop bleeding and simultaneously activates the fibrinolytic system, which dissolves the local unstable thrombus resulting in continuous bleeding. Severe bleeding and prolonged indwelling catheter drainage are obvious risk factors for spinal surgical incision infection. Allogeneic blood transfusion may also pose a risk of immune rejection and increase the risk of disease transmission. It is therefore necessary to identify an effective hemostasis program for patients undergoing spinal surgery. Information on the relative hemostatic activities of local versus intravenous tranexamic acid in patients undergoing posterior open reduction and internal fixation of thoracolumbar fractures is lacking. This study compares the hemostatic outcomes of local and intravenous tranexamic acid in these patients. The experimental conditions mean that it is not possible to perform double-blind evaluation and allocation concealment, which may influence the accuracy of the results. This study will help to identify the optimal administration route for tranexamic acid in patients undergoing posterior open reduction and internal fixation of thoracolumbar fractures in terms of achieving hemostasis, reducing surgical risk, and achieving encouraging therapeutic effects. Date of registration: January 26, 2015. Study execution time: March 2015–December 2015. Additional file 2: SPIRIT Checklist. Study design and authorization: JS; patient recruitment: HHW and XLL; data collection and analysis: YC and DL; Patient information collection and surgical procedures: WZ. All authors approved the final version of this manuscript. The study was approved by the Medical Ethics Committee, General Hospital of Western Theater Command of China (approval No. 2015-keyan-03). The authors certify that they will obtain all appropriate patient consent forms. In the form the patients will give their consent for patients’ images and other clinical information to be reported in the journal. The patients understand that their names and initials will not be published and due efforts will be made to conceal their identity, but anonymity cannot be guaranteed. The statistical methods of this study were reviewed by the biostatistician of General Hospital of Western Theater Command of China. Chang W, Zhang D, Liu W, et al. Posterior paraspinal muscle versus post-middle approach for the treatment of thoracolumbar burst fractures: a randomized controlled trial. Medicine (Baltimore). 2018;97:e11193. Chen ZD, Wu J, Yao XT, et al. Comparison of Wiltse’s paraspinal approach and open book laminectomy for thoracolumbar burst fractures with greenstick lamina fractures: a randomized controlled trial. J Orthop Surg Res. 2018;13:43. Pishnamaz M, Oikonomidis S, Knobe M, et al. Open versus percutaneous stabilization of thoracolumbar spine fractures: a short-term functional and radiological follow-up. Acta Chir Orthop Traumatol Cech. 2015;82:274-281. Xue F, Fu ZG, Zhang DY, et al. Minimal invasive internal fixation with U-shaped break-off pedicle screws for treatent of thoracolumbar fractures. Beijing Da Xue Xue Bao Yi Xue Ban. 2013;45:728-731. Peter C, Dereu D, Casini A, et al. Tranexamic acid for the management of postpartum haemorrhage: current knowledge. Rev Med Suisse. 2018;14:1861-1865. Masuzawa Y, Kataoka Y, Fujii K, et al. Prophylactic management of postpartum haemorrhage in the third stage of labour: an overview of systematic reviews. Syst Rev. 2018;7:156. Schwarz W, Ruttan T, Bundick K. Nebulized tranexamic acid use for pediatric secondary post-tonsillectomy hemorrhage. Ann Emerg Med. 2018. doi: 10.1016/j.annemergmed.2018.08.429. Chapman N. Use of tranexamic acid in trauma patients requiring massive transfusion protocol activation: an audit in a major trauma centre in New Zealand. N Z Med J. 2018;131:8-12. Arslan A, Görmeli G. Using intra-articular tranexamic acid in total knee replacement surgery with and without bleeding control: a prospective randomized double blind study. Eur Rev Med Pharmacol Sci. 2018;22:6127-6132. Nagaraju D, Bhattacharjee R, Vinay K, et al. Efficacy of oral tranexemic acid in refractory melasma: a clinico-immuno-histopathological study. Dermatol Ther. 2018;31:e12704. Kim EJ, Kim YO, Shim KW, et al. Effects of tranexamic acid based on its population pharmacokinetics in pediatric patients undergoing distraction osteogenesis for craniosynostosis: rotational thromboelastometry (ROTEMTM) analysis. Int J Med Sci. 2018;15:788-795. Dabash S, Barksdale LC, McNamara CA, et al. Blood loss reduction with tranexamic acid and a bipolar sealer in direct anterior total hip arthroplasty. Am J Orthop (Belle Mead NJ). 2018. doi: 10.12788/ajo.2018.0032. Zirk M, Zinser M, Buller J, et al. Supportive topical tranexamic acid application for hemostasis in oral bleeding events - Retrospective cohort study of 542 patients. J Craniomaxillofac Surg. 2018;46:932-936. Zhang S, Huang Q, Xu B, et al. Effectiveness and safety of an optimized blood management program in total hip and knee arthroplasty: a large, single-center, retrospective study. Medicine (Baltimore). 2018;97:e9429. Liao L, Chen Y, Tang Q, et al. Tranexamic acid plus drain-clamping can reduce blood loss in total knee arthroplasty: a systematic review and meta-analysis. Int J Surg. 2018;52:334-341. Gerstein NS, Deriy L, Patel PA. Tranexamic acid use in cardiac surgery: hemostasis, seizures, or a little of both. J Cardiothorac Vasc Anesth. 2018;32:1635-1637. Wang W, Duan K, Ma M, et al. Tranexamic acid decreases visible and hidden blood loss without affecting prethrombotic state molecular markers in transforaminal thoracic interbody fusion for treatment of thoracolumbar fracture-dislocation. Spine (Phila Pa 1976). 2018;43:E734-739. Tavares Sánchez-Monge FJ, Aguado Maestro I, Bañuelos Díaz A, et al. Efficacy and safety of the topical application of tranexamic acid in primary cementless hip arthroplasty: prospective, randomised, double-blind and controlled study. Rev Esp Cir Ortop Traumatol. 2018;62:47-54. Liu JL, Zeng WN, Wang FY, et al. Effects of low-dose epinephrine on perioperative hemostasis and inflammatory reaction in major surgical operations: a randomized clinical trial. J Thromb Haemost. 2018;16:74-82. Xie J, Hu Q, Ma J, et al. Multiple boluses of intravenous tranexamic acid to reduce hidden blood loss and the inflammatory response following enhanced-recovery primary total hip arthroplasty: a randomised clinical trial. Bone Joint J. 2017;99-B:1442-1449. Catanzano O, D’Esposito V, Formisano P, et al. Composite alginate-hyaluronan sponges for the delivery of tranexamic acid in postextractive alveolar wounds. J Pharm Sci. 2018;107:654-661. Boese CK, Centeno L, Walters RW. Blood conservation using tranexamic acid is not superior to epsilon-aminocaproic acid after total knee arthroplasty. J Bone Joint Surg Am. 2017;99:1621-1628. Tsutsumimoto T, Shimogata M, Ohta H, Yui M, Yoda I, Misawa H. Tranexamic acid reduces perioperative blood loss in cervical laminoplasty: a prospective randomized study. Spine (Phila Pa 1976). 2011;36:1913-1918. Wang Q, Liu J, Fan R, et al. Tranexamic acid reduces postoperative blood loss of degenerative lumbar instability with stenosis in posterior approach lumbar surgery: a randomized controlled trial. Eur Spine J. 2013;22:2035-2038. Verma K, Errico T, Diefenbach C, et al. The relative efficacy of antifibrinolytics in adolescent idiopathic scoliosis: a prospective randomized trial. J Bone Joint Surg Am. 2014;96:e80. Camarasa MA, Ollé G, Serra-Prat M, et al. Efficacy of aminocaproic, tranexamic acids in the control of bleeding during total knee replacement: a randomized clinical trial. Br J Anaesth. 2006;96:576-582. Wong J, El Beheiry H, Rampersaud YR, Lewis S, Ahn H, De Silva Y, Abrishami A, Baig N, McBroom RJ, Chung F (2008) Tranexamic acid reduces perioperative blood loss in adult patients having spinal fusion surgery. Anesth Analg 107:1479-1486. Chang W, Zhang D, Liu W, Lian X, Jiao Z, Chen W. Posterior paraspinal muscle versus post-middle approach for the treatment of thoracolumbar burst fractures: a randomized controlled trial. Medicine (Baltimore). 2018;97:e11193. He YQ, Xiang C, Zhang JH, et al. Clinical study of application minimally invasive expandable channel in lumbar discectomy and interbody fusion and internal fixation. Zhongguo Gu Shang. 2017;30:395-399. Matthes M, Pillich DT, El Refaee E, et al. Heat generation during bony decompression of lumbar spinal stenosis using a high-speed diamond drill with or without automated irrigation and an ultrasonic bone-cutting knife: a single-blinded prospective randomized controlled study. World Neurosurg. 2018;111:e72-81.